Home How to iPad Tips How to Watch and Play 2014 FIFA World Cup Video on iPad? How to Watch and Play 2014 FIFA World Cup Video on iPad? In recent days, World Cup groups released their squad lists successively and fans has gone to the heated discussion to guest the most splendid match in 2014 FIFA World Cup and prepared to wait for live according to the new released squad list. Actually, fans prefer to watch live but not every fan can stay at home whole day for World Cup live. Instead, it may be a good choice to enjoy World Cup videos on portable devices, like iPad Air, iPad Mini with Retina etc. How to watch and play 2014 FIFA World Cup on iPad? Yes, you can directly watch World Cup videos from YouTube or other video sharing sites. But if you can’t be patient of ads and long-term buffering because for bad network, it is better to download World Cup videos and watch on iPad offline. And you may need a World Cup video downloader and a converter in case the downloaded video format is incompatible with iPad. WinX HD Video Converter Deluxe is such an all-in-one World Cup video downloader and converter to help you fast download YouTube videos and convert video to iPad supported format, MP4, MOV etc. so that you can watch 2014 World Cup videos on iPad smoothly. 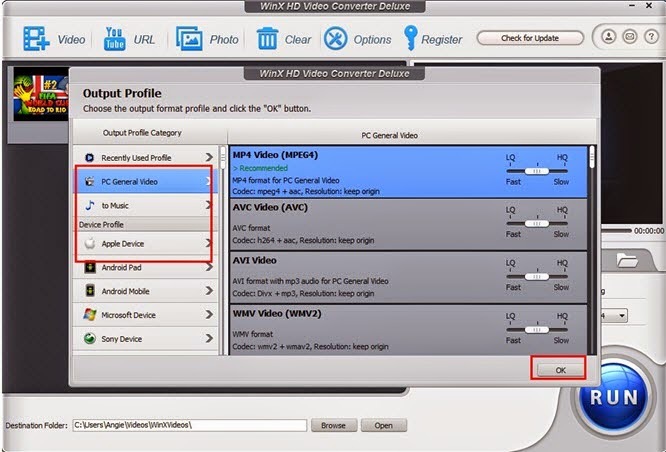 The following WinX HD Video Converter Deluxe guide will show how to download and watch/play 2014 World Cup video on iPad. I will take iPad Air as example in this guide. Step 1. Download and install WinX HD Video Converter Deluxe. Click YouTube URL and a dialog box pops up. Paste YouTube URL in the address bar. Then, click Analyze to get results in the following table. Select the appropriate one and click OK.
After video is downloaded, Output Profile dialog box is shown. Move to Apple Device - iPad Video - iPad Air - OK. Step 4. Convert 2014 World Cup for watching on iPad Air. Click Browse to select Destination Folder and then click RUN button to start conversion. Waiting for a moment, you can get 2014 World Cup video in the destination folder. Transfer it to your iPad Air and enjoy World Cup on iPad anywhere.  You can edit 2014 World Cup video: to add subtitle, crop and trim video.  You can rename the downloaded 2014 World Cup video.  You can preview 2014 World Cup video capture screenshot during conversion.  You can merge videos into one if you have downloaded two or move 2014 World Cup videos.